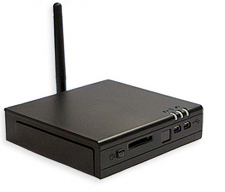 Portwell, a Taiwanese PC manufacturer has just announced a new Intel Atom based platform targeted for embedded market. Named as WEBS-1010, it is being designed with Intel famous Atom Z-5XX series processor coupled with its own US15W NorthBridge/SouthBridge combo chipset suitable for various low power and fan-less applications. What makes this platform so unique is the additional of HDMI video output port integrated into it so that consumers can fully enjoy the hardware graphics decoding capability of its combo chipset thanks to the integrated graphics core. However, from the chipset perspective, there is no HDMI output directly and Portwell may have already added an additional HDMI capable codec chip for the conversion to take place. As differed from Intel Atom N-series solution that paired with 945GSE chipset, US15W combo chipset is able decode and playback media files up to full HD (High Definition) 1080p resolutions. Besides, it features some common interfaces such as USB 2.0, Gigabit Ethernet ports, Mini PCI Express slot, mini SD card slot as well as legacy audio supports and additional IR receiver support and you could probably treat it as a tiny PC in an embedded space. Since it is X86 based, there is almost no constraint for the system to run in any OS (Operating System) including the latest windows 7 and Vista on top of Windows XP, XP Embedded OS. However, with the pricing of around $460, it could be preloaded with Linux OS only but it can be easily upgrade depending on the end usage either as a digital signage, kiosk system, gaming, automotive and even multimedia-centric media server in digital home.